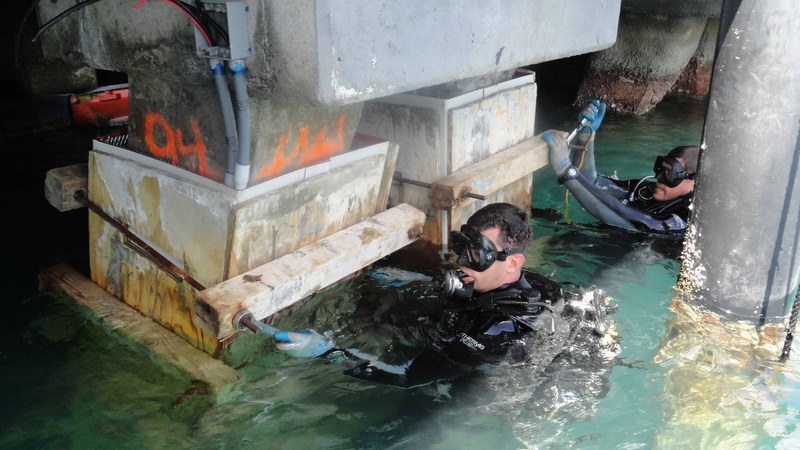 Underwater concrete structures are prone to damage due to many reasons. There are some methods which are specially adapted to repair these damages. Care should be taken to ensure that the damaged area is not contaminated before the application of the repair material. The material used for the repair should be compatible with its underwater usage while placing as well as curing. The cover provided for the concrete structures can spall off due to the accidental damages. To prevent the future corrosion of the reinforcement in the concrete, the damaged area must be repaired or replaced. The areas which are already slightly deteriorated with time, will be prone to severe and dangerous damage in a short period of time, especially in the splash zones. 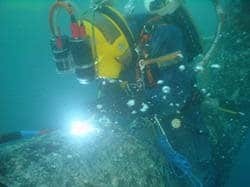 Before starting the repairing procedures, the damaged area must be cleared off of the marine growth and the loose concrete. After the damaged area is cleared, the boundary of the spalled area should be cut to a depth of about 10-20mm depending on the amount of damage done. The splash zones are repaired by the application of the cementitious mortar and in case of small damage area, the epoxy mortar can be utilized. For large area of damage, formwork should be used to hold the repair material in its place which could delay the enhancement work. Epoxy mortar cannot be used for this area because after it hardens, it forms smooth surface which leads to the bond being weak. The repair method and the material selection should be done carefully when a large area of damage has to be restored because the shrinkage and bleeding may lead to a leakage path at the top of parent concrete and the repair material surface. When repairing materials possess high thickness, thermal cracking may develop due to rise of temperature even though surrounding water decline the temperature rise. Additionally the repair of reinforcement is often required because of distortion and corrosion of reinforcement. In this type of repair, formwork is installed in the area to be repaired and a well graded aggregate is compacted in it. Before placing the grout in the aggregate, it is ensured that the aggregate is cleaned with the help of freshwater. 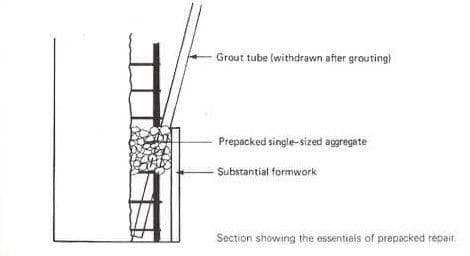 Then, specific grout is injected into the base of the well compacted aggregate in the formwork. The water and voids which are present in the aggregate are expelled out by the grout. The formwork which is placed at the damaged area, should be grout proof to avoid the leakage. Furthermore, there should be proper venting so as to help the voids and sir to escape. It is of great significance that the aggregates fill the formwork till the top of damage region. If the grouting is done in the area where aggregate is not present, then the grout will shrink and will lead to the development of cracks. It is recommended that, vibration is not to be applied during injection to prevent the washing out of grout. This type of repair is similar to the procedure used for repairing the dry structures where injection of cementitious grout or resin can be employed to repair cracks and or voids. The selection for the material depends on the void or crack size and also on the possibility of the predicted displacement of the member in the future. • Cement grout is used when the crack width is greater than few millimeters. • If the crack width is less than 0.1mm, injection is not necessary. If there is evidence of corrosion in the reinforcement, complete repairing should be recommended instead of injection methods. This type of repair is used when large surface area or beams or columns are encased. Dry processing is employed in this method where dry mix is transferred by a hose and water is added to the dry mix at the nozzle. Guniting method is actually not suitable for the repair of underwater concrete structures but it can be utilized in slash zones or tidal zones, if rapid setting additives are employed. 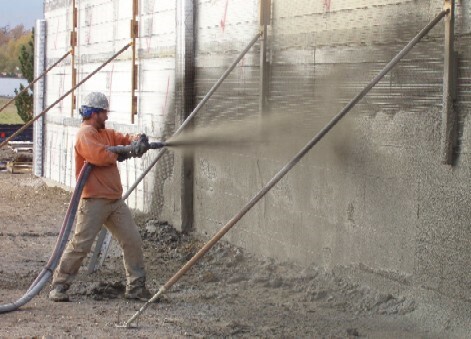 The maximum thickness of shotcrete is limited to 50mm but in case of thick layer, a second layer can be placed. 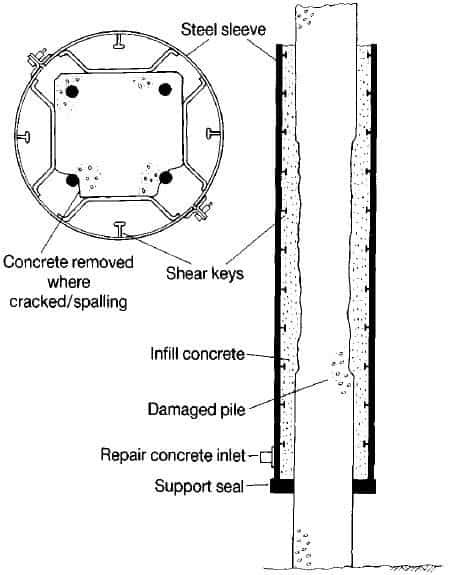 This type of repair employs a steel sleeve which is used around a pile or column. Then the space between the sleeve and pile or column is filled with mortar or concrete. The steel sleeve should be designed such that there should be enough space for further reinforcement corrosion. 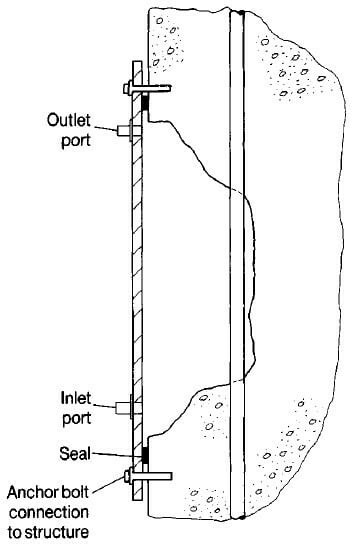 The sleeve should extend and exceed the damaged length of the pile/column from both top and bottom and should bear the respective forces if the bars are ineffective due to corrosion.